A new study into the proliferation of “fake news” has found Australia is one of the globe’s top culprits for the practice. The study, titled Reuters Institute Digital News Report, found that 25 per cent of Australians felt they were exposed to completely made-up news in the past seven days. 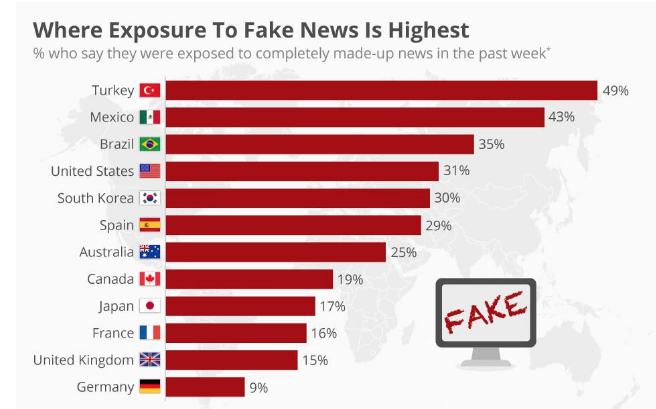 Top of the pile were the Turks, with a staggering 49 per cent believing they’d been exposed to some form of fake news in the last week, followed by Mexico (43 per cent) and Brail (35 per cent). Australia ranked seventh on the global list. Arguably the home of “fake news”, the US, came in at 31 per cent, while in the UK – with rampant claims of falsehoods surrounding Brexit – was only 15 per cent.